The Lovely Bones is a 2009 supernatural drama film directed by Peter Jackson, and starring Mark Wahlberg, Rachel Weisz, Susan Sarandon, Stanley Tucci, Michael Imperioli, and Saoirse Ronan. The screenplay by Fran Walsh, Philippa Boyens, and Jackson was based on Alice Sebold’s award-winning and bestselling 2002 novel of the same name. It follows a girl who is murdered and watches over her family from the in-between, and is torn between seeking vengeance on her killer and allowing her family to heal. An international co-production between the United States, the United Kingdom, and New Zealand, the film was produced by Carolynne Cunningham, Walsh, Jackson, and Aimee Peyronnet, with Steven Spielberg, Tessa Ross, Ken Kamins, and James Wilson as executive producers. Principal photography began in October 2007 in New Zealand and Pennsylvania, United States. The film's score was composed by Brian Eno. The Lovely Bones was first released on December 26, 2009, in New Zealand, and then internationally in January 2010. The film's North American release date was changed multiple times, with a limited release on December 11, 2009, and a wider release on January 15, 2010. It was released to mainly mixed reviews from critics; the story and its message were generally criticized, with praise mainly aimed at the visual effects, Peter Jackson's direction, and the performances of Ronan and Tucci. In the film's opening weekend, in limited release, it grossed $116,616, despite only having been screened in three theaters, placing it at 30th place on the box office chart. The Lovely Bones grossed over $44 million in North America. The film also received numerous accolades, including Golden Globe, Screen Actors Guild, BAFTA, and Academy Award nominations. In 1973, 14-year-old high school freshman Susie Salmon dreams about becoming a photographer. One day, Ray, a boy she has a crush on, approaches her at school and asks her out. As Susie walks home through a cornfield, she runs into her neighbor, George Harvey, who coaxes her into his underground den. Inside, Susie becomes uncomfortable and attempts to leave; when he grabs her, the scene fades until she is seen rushing past classmate Ruth Connors, apparently fleeing Harvey's den. The Salmons become worried when Susie fails to return home from school. Her father, Jack, searches for her, while her mother, Abigail, waits for the police. In town, Susie sees Jack, but he does not respond to her when she calls. Susie runs home to find Harvey soaking in a bathtub. After seeing her bracelet hanging on the sink faucet near a bloody shaving razor, Susie realizes she never escaped the den and was murdered by Harvey. Screaming, she is pulled into the "In-Between", that is neither Heaven nor Earth. From there, Susie watches over her loved ones, unable to let go despite the urging of her new afterlife friend, Holly. Investigating Susie's disappearance with Detective Fenerman, Jack thinks Susie was murdered by someone she knew. He researches neighbors and comes to think Harvey is the killer. Fenerman is unable to find any evidence pinpointing Harvey as a suspect, as Harvey cleaned up. Susie's sister, Lindsey, agrees with Jack's suspicions, but their casework takes a toll on Abigail, and Jack invites Abigail's alcoholic mother, Lynn, to move in with them. Feeling alienated from her husband, Abigail leaves for California. Susie, in her afterlife, learns that Harvey, who has now targeted Lindsey as his next victim, has murdered six other girls, including Holly, and that he stuffed Susie's body into a safe in his basement. One night, Jack, carrying a bat, trails Harvey into the cornfield. However, Jack accidentally stumbles across Susie's friend, Clarissa. Her boyfriend, who mistakenly thinks his girlfriend is being assaulted, nearly bludgeons Jack to death as Harvey watches from a hiding spot. As Jack recuperates, Lindsey breaks into Harvey's house looking for evidence that he killed Susie. Upstairs, she finds a notebook containing a sketch of the den, a lock of Susie's hair, and news articles about Susie's disappearance. Harvey returns home and almost catches Lindsey in his house, but she escapes and rushes home to discover that her mother has returned. Not wishing to spoil her parents' reunion, she gives the book to her grandmother, who contacts the police. Harvey has already fled, having seen Lindsey running from his home – he takes the safe containing Susie's remains with him. Susie's afterlife begins expanding into a larger heaven, and she is greeted by Harvey's other victims—now showing nine, including Susie. She resists Holly's urging to enter Heaven along with the others, claiming she has one final thing to do. Meanwhile, Susie's classmates Ruth and Ray are present when Harvey drives up to dispose of the safe at a sinkhole dump site. Susie returns to Earth and enters Ruth's body, causing Ruth to faint. Ray rushes to Ruth's aid only to realize she has become Susie. They kiss, completing Susie's last wish, and she returns to Heaven. Meanwhile Harvey dumps the safe in a sinkhole, leaving it to disappear in the muddy water as he drives away. Sometime later, Harvey meets a young woman outside a diner and offers her a ride, but she rejects him and leaves. A large icicle falls from an overhead branch, hitting Harvey on the shoulder. He loses his balance on the ice and falls backward over a cliff to his death. Time passes, and Susie sees that her family is healing, which Susie refers to as "the lovely bones" that grew around her absence. As the film concludes, Susie finally enters Heaven, telling the audience: "My name is Salmon, like the fish; first name Susie. I was 14 years old when I was murdered on December 6, 1973. I was here for a moment and then I was gone. I wish you all a long and happy life." Saoirse Ronan as Susie Salmon, the main character and narrator. She is a 14-year-old girl who is killed by her neighbor. Ronan was 13 years old at the time of her casting and filming. Ronan and her family were originally reluctant for Ronan to accept the role because of the film's subject matter, but agreed after meeting with Jackson. Stanley Tucci as George Harvey, a serial killer who murders Susie. Tucci stated that he had researched his role by watching documentaries and reading books by criminal profiler John E. Douglas about catching serial killers. Tucci stated that his wife, Kate, had strongly urged him not to accept his role in the film because she felt, after reading the novel, that the subject matter was "too harrowing." Mark Wahlberg as Jack Salmon, Susie's father, who becomes obsessed with his daughter's murder case. Wahlberg stated that his role in the film encouraged him to be a more cautious parent with his three children and to talk to them more about "not talking to strangers." Before Wahlberg's casting, Ryan Gosling was set to play the role but dropped out of the film in October 2007, one month before filming. Gosling had gained weight and grown a beard for the role, but said, "The age of the character versus my real age [of twenty-six] was always a concern of mine. Peter [Jackson] and I tried to make it work and ultimately it just didn't. I think the film is much better off with Mark Wahlberg in that role." Gosling later admitted that the real reason for his firing was that he had arrived for filming 60 lbs. overweight and sporting a beard, without having discussed the physical change with Jackson. Rachel Weisz as Abigail Salmon, Susie's mother. After Susie's murder, her mother despairs and abandons the family. Weisz stated that playing the character and the film and novel's "uplifting theme" made her look at life as a "treasure" and the film gave her a "positive feeling" rather than a "depressed" one. Susan Sarandon as Grandma Lynn, Susie's grandmother. Sarandon stated that her character is like a "comic relief" and that her character deals with the pain of Susie's death by drinking, smoking and shooting guns. Rose McIver as Lindsey Salmon, Susie's younger sister. She is the first to suspect that Harvey was involved in Susie's death. Jackson cast McIver particularly because she was an unknown actress. Mclver stated that she had read and been a fan of the novel before having been cast in the film. Michael Imperioli as Detective Len Fenerman, the detective in charge of investigating Susie's death. Christian Thomas Ashdale as Buckley Salmon, Susie's younger brother. Reece Ritchie as Ray Singh, Susie's love interest and friend who is strongly affected by Susie's death. Charlie Saxton as Ronald Drake, one of the murder suspects. AJ Michalka as Clarissa, Susie's best friend. Michalka was better known as a musician prior to her casting. Carolyn Dando as Ruth Connors, a classmate of Susie's. Jackson stated that, after he had searched all over the world for the role, he ultimately chose to cast Dando, a relatively unknown actress, who was working as a waitress before her casting. Nikki SooHoo as Denise "Holly" Le Ang, Susie's best friend in Heaven and another of Harvey's victims. In May 2000, Film4 Productions acquired feature film rights to Alice Sebold's novel The Lovely Bones, when it was a half-written manuscript. Producer Aimee Peyronnet had sought to attract studio interest to the manuscript, and an insider informed Film4's deputy head of production, Jim Wilson, of the project. The company attached Luc Besson and Peyronnet's production company Seaside to the project, two years before the novel's release. By February 2001, Lynne Ramsay was hired to direct and write the film adaptation of the novel. In July 2002, Channel 4 shut down Film4, causing Hollywood studios and producers to pursue acquisition of feature film rights to The Lovely Bones, which had spent multiple weeks at the top of the New York Times Best Seller list. The film adaptation, which had been estimated at a budget of $15 million, remained with Channel 4 under its newly developed inhouse film unit, with Ramsay still contracted to write and direct. By October 2002, Ramsay was writing the script with fellow screenwriter Liana Dognini, with filming planned for summer 2003. Author Sebold was invited by the producers to provide input on the project. Ramsay, who had read the novel in manuscript prior to publication, said in 2012 that her adaptation departed from it significantly. The scenes with Susie in heaven would have been depicted purely as her father's imagination. He would have become friends with Mr. Harvey, never suspecting him of having killed his daughter. "I really didn't like the My Little Pony, she's-in-heaven, everything's-O.K. aspect", she told The New York Times in 2012. In July 2003, the studio DreamWorks negotiated a first look deal with producer Peyronnet, after DreamWorks co-founder Steven Spielberg expressed interest in the project. DreamWorks did not acquire the rights to the novel, and Ramsay was eventually detached from the project as, she says, FilmFour wanted a version more faithful to the novel. In April 2004, producers Peter Jackson, Fran Walsh, and Philippa Boyens entered negotiations to develop the project. Jackson described the book as "a wonderfully emotional and powerful story. Like all the best fantasy, it has a solid grounding in the real world." By January 2005, Jackson and Walsh planned to independently purchase film rights and to seek studio financing after a script had been developed. The producers sought to begin adapting a spec script for The Lovely Bones in January 2006, with the goal of script completion and budget estimation by the following May. Jackson explained he enjoyed the novel because he found it "curiously optimistic" and uplifting because of the narrator's sense of humor, adding there was a difference between its tone and subject matter. He felt very few films dealt with the loss of a loved one. Jackson foresaw the most challenging element in the novel to adapt was the portrayal of Susie, the protagonist, in her heaven, and making it "ethereal and emotional but not hokey." Saoirse Ronan explained Jackson chose to depict the afterlife as depending on Susie's emotions. "Whenever Susie feels happy, Heaven is sunny and there's birds and everything. Whenever it’s not so great, it's raining or she’s in the middle of an ocean." Jackson described the book's description of "heaven" as being an "In-Between" rather than a true heaven and said he was not trying to paint a definitive picture of Heaven itself. "[W]hen Jackson created Susie's heaven, in a 1973 world, he went through the Partridge Family television show archives as a reference." "[I] basically [added] more violence and suffering, [the audience] wanted far more violence [...] They just weren't satisfied [...] We got a lot of people telling us that they were disappointed with this death scene, as they wanted to see [the character] in agony and suffer a lot more, we had to create a whole suffering death scene just to give people the satisfaction they needed." A 120-page draft of the script was written by September 2006. In April 2007, the script was completed by Jackson, Walsh and Boyens; Jackson intended to direct. The three producers began seeking a studio partner to finance the film adaptation. Besides the major studios, smaller companies including United Artists were also contacted. New Line Cinema was excluded from negotiations because of Jackson's legal dispute with the studio over royalties from his The Lord of the Rings trilogy. Jackson sought a beginning $65 million budget for The Lovely Bones, also requesting from studios what kind of promotional commitments and suggestions they would make for the film adaptation. By May, four studios remained interested in the project: DreamWorks, Warner Bros., Sony, and Universal. The Lovely Bones was sold to DreamWorks for $70 million. Paramount Pictures received the rights to distribute the film worldwide. Production began in October 2007 in the U.S. state of Pennsylvania and New Zealand. Shooting in parts of Delaware, Chester and Montgomery counties, including Hatfield, Ridley Township, Phoenixville, Royersford, Malvern and East Fallowfield, lasted a few weeks, and most of the studio shooting was done in New Zealand. In December 2008, Brian Eno signed on to compose the film's score. Fran Walsh, a big fan of his work, suggested him to Jackson. Jackson had called Eno to request use of two of his early tracks to evoke atmosphere for the 1970s scenes in the film. When Eno asked if he could compose the whole score, Jackson was surprised, since he had heard Eno did not like working on films. For the film's ending, Eno uncovered a demo he had done in 1973 and reunited with the vocalist to create a proper version for the film, commenting: "That song from 1973 was finally finished in 2008!" In November 2009, Jackson stated that he re-shot new footage of Harvey's death scene after test audiences said it was not violent enough and wanted to "see more of Harvey in pain." Jackson said it was important to him that the movie receive a PG-13 rating so that the film could appeal to the widest possible audience, despite the necessarily violent nature of some scenes. Jackson at 2009 Comic-Con film festival. At the festival Jackson discussed The Lovely Bones and screened a clip from it. The Lovely Bones was originally scheduled for release on March 13, 2009, but it was delayed to December 11, 2009, as the studio became interested in releasing the film for "awards season," which gave Jackson an opportunity to make some effects shots larger in scope. The film then received a limited theater release on December 11, 2009, in the United States. The film was originally set to have a wider United States theater release on December 25, 2009 (Christmas Day), as part of a campaign to build its momentum into January 2010. In early December it was confirmed that the United States release date had been pushed back by three weeks to January 15, 2010. Paramount and DreamWorks did not give a reason for the change of the release date. The film premiered in New Zealand on December 26, 2009, and was released in the United Kingdom on January 29 and in other countries in January 2010. According to the Los Angeles Times, Paramount invested $70 million in production and an additional $85 million in worldwide marketing and distribution. In December 2009, the Los Angeles Times described the marketing and promotion of The Lovely Bones as having been a "heavy advertising campaign." In late July 2009, as part of the promotion, Jackson talked about the film and screened a 4​1⁄2 minute clip at the San Diego Comic-Con International film festival. As part of marketing for the film, in August 2009, people were allowed to enter a contest to win a trip to Wellington, for the film's New Zealand premiere on December 14, 2009. The offer included, if the winner lived outside of Wellington, one night’s accommodation and a voucher for flight or petrol to Wellington. A teaser trailer was released in August 2009, days before the film's official trailer. The official trailer debuted on the television series Entertainment Tonight and was released online shortly afterwards. In August 2009, Jackson offered a "behind-the-scenes look" at the film and discussed elements (mainly violence) in the film's plot line. The Los Angeles Times reported that Paramount had originally expected the film to appeal to a "sophisticated, adult audience," but after poor revenue and average reviews, the studio decided to redirect the film to an audience in another age group. Surveys showed that the film was favored more by females aged 13–20 than by any other demographic. Paramount began to screen the movie "aggressively for high school- and college-age girls" during its three-screen limited release. On December 11, 2009, the film was released on three screens in Los Angeles and New York. As of January 4, 2010, the film had grossed over $389,000 in the US. Claudia Eller and Ben Fritz of the Los Angeles Times felt that it did poorly at the box office in the first few weeks of its release because of average reviews and negative word-of-mouth. During its opening-weekend release on three screens, it earned over $116,616, an average of estimated $38,872 per-theater revenue. The film's revenue placed it at thirtieth place on the box office chart. In the film's second and third weeks of release, the film saw a decrease; in the fourth week, it had a 54.3-percent increase. When put into wide release on January 15, 2010, it grossed $17,005,133 that weekend, ranking number three at the domestic box office. By the end of its run, The Lovely Bones had made $44,114,232 domestically, and $49,507,108 overseas, for a worldwide total of $93,621,340. The film was released in the US on DVD and two-disc Blu-ray April 20, 2010 and in the United Kingdom on June 11, 2010. Although Ronan and Tucci were praised for their performances, The Lovely Bones received mixed reviews from critics. On review aggregator Rotten Tomatoes, the film has a rating of 32%, based on 238 reviews, with an average rating of 5/10. The site's critical consensus reads, "It's stuffed full of Peter Jackson's typically dazzling imagery, but The Lovely Bones suffers from abrupt shifts between horrific violence and cloying sentimentality." Metacritic gave the film a score of 42 out of 100, based on 36 critics, indicating "mixed or average reviews". It is Peter Jackson's lowest rated film to date. Ian Freer of Empire gave the film 4/5 stars. Freer emphasized the "bold, daring original filmmaking, with arguably more emotional and intellectual meat to chew on than either the Rings trilogy or Kong." Freer noted that, like The Lord of the Rings, the film "does a fantastic job with revered, complex source material" and that, since it is "as terrific on terra firma as it is audacious in its astral plane", it is "doubtful" that there would be a "more imaginative" and "courageous film" in 2010. Richard Corliss of Time wrote that "through [Peter] Jackson's art" and Ronan's "magic" the "obscenity of child murder has been invested with immense gravity and grace" and "like the story of Susie's life after death, that's a miracle." Peter Travers of Rolling Stone felt that the film was "conveyed" in a "remarkable performance" by Ronan and described Tucci as being "magnificent as a man of uncontrollable impulses" to "help Jackson cut a path to a humanity that supersedes life and death." Travers praised Jackson for building "jolting suspense." Despite praising the film, however, Travers noted that while the book "never flinched," the film does, and while the "business is being transacted" by Jackson with a "Lord of the Rings fantasy" the film "attunes himself to a family tragedy." Claudia Puig of USA Today gave the film 2/4 stars, remarking that while "[Peter] Jackson gets the thriller scenes right", the "conceit of Susie trapped in a DayGlo world between the one she left and her final resting place, imparting lessons on coping with death, feels preachy." Puig also described the film as having "clashing tones" that veer from "lightheartedness to heavy-handedness." Puig also criticized the film's computer-generated imagery, describing it as being "cheesy" and felt that it broke "no ground." Kirt Honeycutt, of the Hollywood Reporter, described the film as telling "a fundamentally different story" which is "one that is not without its tension, humor and compelling details", but that "it's also a simpler, more button-pushing tale that misses the joy and heartbreak of the original." Honeycutt also described Jackson as having transformed Sebold's "startling, unique novel about the aftermath of a terrible murder" into a story that's more "focused on crime and punishment." "[Alice] Sebold's book would've had a tough leap to the multiplex no matter who guided it. But [Peter] Jackson is too enamored with the idea of mixing heaven and the heebie-jeebies, so he's made the skeevy equivalent of a Mitch Albom book with some pulp fiction pressed between its covers." Stephanie Zacharek, of Salon.com, viewed the film as being "an expensive-looking mess that fails to capture the mood, and the poetry, of its source material" because "good actors fighting a poorly conceived script, under the guidance of a director who can no longer make the distinction between imaginativeness and computer-generated effects." Todd McCarthy, of Variety, felt that Jackson had undermined the "solid work from a good cast" with "show-offy celestial evocations" that "severely disrupt the emotional connections with the characters." McCarthy stated that he felt that the film, overall, was a "significant artistic disappointment." Joe Neumaier, of New York Daily News, described Jackson as having "siphoned out all the soulfulness" that made the author's "combination thriller/afterlife fantasy a best-seller" and that the film was "a gumball-colored potboiler that's more squalid than truly mournful." Neumaier also wrote that the film and Jackson "wasted" a "good cast." Roger Ebert of Chicago Sun-Times gave the film 1.5 stars out of 4, calling it "deplorable", and criticizing the apparent message that Susie's murder eventually made her happier. He was also critical of the film's portrayal of Heaven, which he compared to "a happy gathering of new Facebook friends". However, he praised the acting, stating that "this whole film is Jackson's fault". According to the British Board of Film Classification (BBFC), the rating given to The Lovely Bones received 24 objections, more than any other movie in 2010. The BBFC report states, "Many found the film to be a shocking and upsetting experience. The scene in which young Susie is entrapped by the killer, and the subsequent sequence in which the killer soaks in a bath after the murder, were compared by some complainants to scenes in ‘18’ rated horror films." The BBFC rated the movie a 12A, and many complained that the movie was upsetting for a younger audience. Nevertheless, the BBFC defended its rating: "The Lovely Bones lacked any explicit detail of the murder and any sexual elements were downplayed. The audience’s sympathies remain entirely with the family and the film had many positive messages about life." ^ "THE LOVELY BONES (12A)". British Board of Film Classification. November 24, 2009. Retrieved November 8, 2014. ^ a b "Lovely Bones (EN)". Lumiere. Retrieved 25 June 2017. ^ a b c d e f g "THE LOVELY BONES". Box Office Mojo. Retrieved 2009-12-26. ^ "The Lovely Bones (2009)". Box Office Mojo. Retrieved 2010-02-27. ^ a b Michael Fleming, Pamela McClintock (2007-06-12). "Weisz to star in 'Lovely Bones'". Variety.com. Retrieved 2009-12-26. ^ Yvonne Villarreal (2009-12-10). "Saoirse Ronan of 'The Lovely Bones' stays on balance". LATimes.com. Retrieved 2009-12-28. ^ a b "TUCCI'S WIFE ADVISED AGAINST THE LOVELY BONES ROLE". ContactMusic.com. 2009-12-17. Retrieved 2009-12-27. ^ Gregg Goldstein (2007-07-23). "Tucci cracks DW's 'Bones'". TheHollywoodReporter.com. Archived from the original on December 4, 2008. Retrieved 2009-12-27. ^ Michelle Kung (2009-12-03). ""The Lovely Bones" Star Stanley Tucci Puts a Psycho on His Resume". WSJ.com. Retrieved 2009-12-27. ^ a b Michael Fleming, Tatiana Siegel (2007-10-21). "Wahlberg steps into 'Bones'". Variety.com. Retrieved 2009-12-26. ^ a b c Sandra Hall (2009-12-26). "The Lovely Bones". SMH.au. Retrieved 2009-12-28. ^ a b c d e Rebecca Murray (2009-12-24). "Behind the Scenes of 'The Lovely Bones' with Saoirse Ronan". Movies.About.com. Retrieved 2009-12-28. ^ a b c Reuters (December 28, 2009). "The Lovely Bones overcomes rough start". Au.News.Yahoo.com. Archived from the original on August 14, 2010. Retrieved December 28, 2009. ^ Stax (2007-10-29). "Gosling Sets Bones Straight". IGN.com. Retrieved 2009-12-26. ^ O'Neal, Sean. "Ryan Gosling admits he was fired from The Lovely Bones for being too fat". Retrieved September 16, 2017. ^ a b Monika Bartyzel (2007-11-09). "Susan Sarandon Talks About Her 'Lovely Bones'". Cinematical.com. Retrieved 2009-12-27. ^ a b Pamela McClintock (2007-07-26). "Sarandon joins 'Lovely Bones'". Variety.com. Retrieved 2009-12-27. ^ a b c d "Jackson chooses Kiwi actresses". TVNZ.co.nz. 2007-08-28. Retrieved 2009-12-27. ^ Borys Kit (2007-08-02). "Imperioli connected to "Lovely Bones"". TheHollywoodReporter.com. Archived from the original on October 1, 2007. Retrieved 2009-12-27. ^ "Lowestoft's Lovely Bones". BBC.co.uk. 2007-11-02. Retrieved 2009-12-27. ^ Amy Longsdorf (2009-12-13). "Bucks-bred Charlie Saxton rocks in 'Bandslam'". Articles.Mcall.com. Retrieved 2009-12-27. ^ a b Shawn Adler (2007-09-24). "Pop Sensation AJ Michalka Cast In Jackson's 'Lovely Bones'". MTV. Retrieved 2009-12-27. ^ "Lindsey and Ruth roles cast for The Lovely Bones". Black Magic - NZ Film News. August 28, 2007. Archived from the original on October 11, 2007. ^ a b "FilmFour makes 'Lovely' buy for Seaside". Variety. 2000-05-31. Retrieved 2007-06-13. ^ a b Adam Dawtrey (2002-10-13). "'Bones' remains at C4". Variety. Retrieved 2007-06-13. ^ Jonathan Bing (2001-02-07). "U.K.'s FilmFour pages quirky fare for pix". Variety. Retrieved 2007-06-13. ^ Nicole Panter (2002-11-17). "Bestselling author goes incognito in La La Land". Variety. Retrieved 2007-06-13. ^ a b Kois, Dan (January 13, 2012). "Lynne Ramsay Is Back. Finally". The New York Times. Archived from the original on January 15, 2012. Retrieved January 14, 2012. ^ Marc Graser; Jonathan Bing (2003-07-06). "D'Works inks 'Bones' key". Variety. Retrieved 2007-06-13. ^ Nicole Laporte (2003-11-02). "Inside Move: Peyronnet digs up lit paydirt". Variety. Retrieved 2007-06-13. ^ Michael Fleming (2004-04-22). "Jackson team bones up on 'Lovely'". Variety. Retrieved 2007-06-13. ^ a b Brian Sibley (2006). Peter Jackson: A Film-maker's Journey. London: Harper Collins. pp. 555–57. ISBN 0-00-717558-2. ^ Michael Fleming (2005-01-17). "Putting his own bucks into 'Bones'". Variety. Retrieved 2007-06-13. ^ a b Scott Bowles (2009-04-19). "'Lovely Bones' was lovely to make". USA Today. Retrieved 2009-04-20. ^ Silas Lesnick (2008-01-08). "Saoirse Ronan on The Lovely Bones". IESB. Retrieved 2008-01-10. ^ a b c Nicole Sperling (2009-07-24). "Peter Jackson at Comic-Con: 'Hobbit' talk and a peek at 'Lovely Bones'". PopWatch.EW.com. Retrieved 2009-12-26. ^ a b Ben Child (2009-11-17). "Peter Jackson: Lovely Bones test audience demanded more violence". Guardian.co.uk. London. Retrieved 2009-12-26. ^ a b Eric Vespe (2006-09-13). "Quint and Peter Jackson, Part II: THE LOVELY BONES!!!". Ain't It Cool News. Retrieved 2007-06-13. ^ Pamela McClintock (2007-04-30). "'Bones' up for bidding". Variety. Retrieved 2007-06-13. ^ Michael Fleming; Pamela McClintock (2007-05-02). "High-priced directors pitch projects". Variety. Retrieved 2007-06-13. ^ Borys Kit (2007-05-03). "Project auctions: One hot, one not". The Hollywood Reporter. Archived from the original on 2007-06-04. Retrieved 2007-06-13. ^ "Jackson Sells, Mann/DiCaprio Doesn't". Variety.com. 2007-05-29. Retrieved 2009-12-26. ^ Fleming, Michael (2007-06-27). "Ryan Gosling set for 'Lovely Bones'". Variety.com. Retrieved 2009-12-26. ^ Domizio, Tony Di (November 2, 2007). "Hooray for Hatfield". Thereporteronline.com. Archived from the original on March 10, 2012. Retrieved February 27, 2010. ^ "Intermittent Road Closures-Movie Production" (PDF) (Press release). East Fallowfield Township Police Department. November 2, 2007. Archived from the original (PDF) on December 15, 2007. Retrieved November 12, 2007. ^ Tom Cardy (2008-12-20). "Eno signs up to write music for Lovely Bones". The Dominion Post. Retrieved 2008-12-21. ^ "News Etc". Empire. June 2009. pp. 26–30. ^ "G.I. Joe, The Lovely Bones Release Dates". ComingSoon.net. 2007-11-19. Retrieved 2009-12-26. ^ Brandon Grey (2009-12-14). "Weekend Report: 'Princess and the Frog' Leaps to the Top". BoxOfficeMoJo.com. Retrieved 2009-12-26. ^ a b c "Peter Jackson's The Lovely Bones Pushed to January". TheDRRoom.com. 2009-12-07. Retrieved 2009-12-26. ^ a b c d e Claudia Eller, Ben Fritz (2009-12-24). "Young women targeted for 'Lovely Bones' marketing push". LATimes.com. Retrieved 2009-12-28. ^ a b MediaWorks (2009-08-04). "MORE FM 'THE LOVELY BONES' PROMOTION TERMS & CONDITIONS" (PDF). MoreFM.co.nz. Retrieved 2009-12-27. ^ Richard Brunton (2009-08-04). "The Lovely Bones teaser footage online". FilmStaker.uk. Retrieved 2009-12-27. ^ Meredith Woerner (2009-08-24). "Peter Jackson Explains How To Make Murder Beautiful". Retrieved 2009-12-27. ^ "THE LOVELY BONES (2009): Weekend Box Office Results". BoxOfficeMoJo.com. Retrieved December 28, 2009. ^ Submitted by Terminal on Fri, 02/19/2010 - 10:18pm. (2010-02-19). "The Lovely Bones DVD / Blu-ray Art". Dreadcentral.com. Retrieved 2010-02-27. ^ "Lovely Bones, Hits and Misses". Newser.com. 2009-12-11. Retrieved 2010-02-27. ^ "The Lovely Bones Movie Reviews, Pictures". RottenTomatoes.com. Retrieved 2010-08-24. ^ "Lovely Bones, The (2009): Reviews". Metacritic. Retrieved 2009-12-25. ^ a b c Ian Freer (2009-12-12). "Review of The Lovely Bones". Empire.com. Retrieved 2009-12-25. ^ Richard Corliss (2009-12-10). "'The Lovely Bones' Review: Dead Girl's Love Story". Time.com. Retrieved 2009-12-25. ^ a b Peter Travers (2009-12-10). "Lovely Bones". RollingStone.com. Retrieved 2009-12-25. ^ a b c Claudia Puig (2009-12-12). "'The Lovely Bones' breaks between page and screen". USAToday.com. Retrieved 2009-12-25. ^ a b Kirt Honeycutt (2009-11-24). "The Lovely Bones -- Film Review". TheHollywoodReporter.com. Archived from the original on January 10, 2010. Retrieved 2009-12-25. ^ a b c Joe Neumaier (2009-12-11). "The Lovely Bones". NYDailyNews.com. Retrieved 2009-12-25. ^ Stephanie Zacharek (2009-12-10). "The Lovely Bones Movie Review". Salon.com. Retrieved 2009-12-25. ^ "The Lovely Bones". Chicago Sun-Times. 2010-01-13. Retrieved 2010-01-14. ^ "Yahoo Movies UK". uk.movies.yahoo.com. Archived from the original on June 15, 2011. Retrieved September 16, 2017. 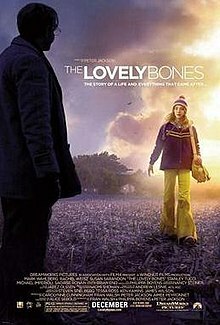 ^ "Lovely Bones drew most complaints to UK ratings body". BBC News. June 13, 2011. Retrieved November 21, 2011. ^ "'The Lovely Bones' most complained about film - NME". June 14, 2011. Retrieved September 16, 2017. ^ Child, Ben (2011-06-14). "The Lovely Bones attracts most complaints in 2010". The Guardian. London. ^ BAFTA (2011-05-22). "63RD BRITISH ACADEMY OF FILM AND TELEVISION AWARDS". BAFTA.org. Retrieved 2011-05-22. ^ HFPA News (December 15, 2009). "THE 67TH ANNUAL GOLDEN GLOBE AWARDS NOMINATIONS". GoldenGlobes.org. Archived from the original on December 15, 2009. Retrieved 2009-12-15. ^ a b "The Lovely Bones : Awards". IMDb.com. Retrieved 2009-12-25.